Primitivo There are 2 products. Ruby red in color with a notable bouqet of red fruits and distinctive hints of cherries and plums. Velvety and long on the palate. 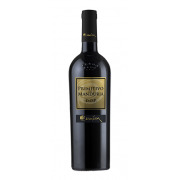 A typical primitivo, capable tones to enhance softness and pleasantness, exhuberant on the palate with its black berries and with a persistant sensation of a well round wine.